This very well-renovated 3 bedroom home close to the Atlantic Ocean is ready for summer guests. 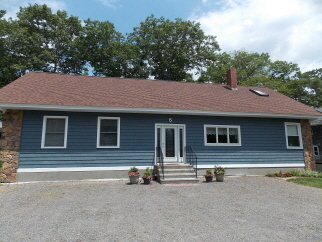 The welcoming property is located just off Freeman St in York Beach, a very short walk to the beach and downtown. One floor living with a loft, this vacation spot has 3 bedrooms (1 queen, 1 double, 4 twins in the kids' room, as well as a double futon in the den/fourth bedroom), 2 baths, each with shower and one with tub, large living room (with pull-out double couch) and sitting/game area, dining room, new kitchen with dishwasher, and a furnished and finished loft to get away and relax. There is a large deck with bbq and ocean views, a yard, parking for 4 cars, multiple tvs and WIFI, full-sized washer/dryer and more. $3000 a week for a clean, bright and well-updated getaway that sleeps up to 10 and is conveniently located close to beaches, shopping, dining, playgrounds and more. No pets please.